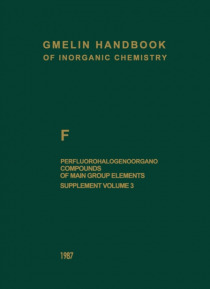 This third volume of the Supplement Series supplying the Main Volumes of the series "e;Perfluorohalogenoorgano Compounds of Main Group Elements"e;, Part 1 to 9, completes the treatment of the compounds of the Main Group VI elements. It covers sulfur(IV) compounds, sulfonic acids, sulfonic anhydrides, and sulfonates, sulfur(VI) oxides, sulfonyl nitrogen compounds, sulfonyl halides, sulfur(V… I) halides, and the compounds of selenium and tellurium. It also includes the perfluorohalogenoorgano compounds of iodine in oxidation states higher than one and contains a formula index for the Supplement Volumes 1, 2, and 3. The Supplement Series will be concluded by the description of the nitrogen compounds. Concept, organization, and selection as to the coverage of the material are the same as in the Main Volumes. Title compounds are newly synthesized ones as well as those compounds already referred to in the Main Volumes and for which new facts have been published. Conventions as to the presentation of the data are given in the prefaces of the Main Volumes. In contrast to the convention for NMR chemical shifts used previously, chemical shifts downfield from the standard are designated as positive, according to the recommendations of the IUPAC Commission on Molecular Structure and Spectroscopy (Pure and Applied Chemistry 29 625/8, 45  217/9). I wish to thank Prof. Dr. Dr. h.c. E. Fluck and his co-workers for their excellent cooperation. I also wish to take the opportunity to express my appreciation to colleagues who assisted me by providing reprints and patents.